Whether you chair a meeting or are a participant, you want to make sure that your meetings work for you and the other participants. Get it right and you’ll communicate effectively, discuss issues, share ideas and agree actions to move things forward positively. Get it wrong and everyone leaves frustrated thinking “another useless meeting, what was the point?” When I work with teams, meetings, or the frustration of meetings is always a hot topic. 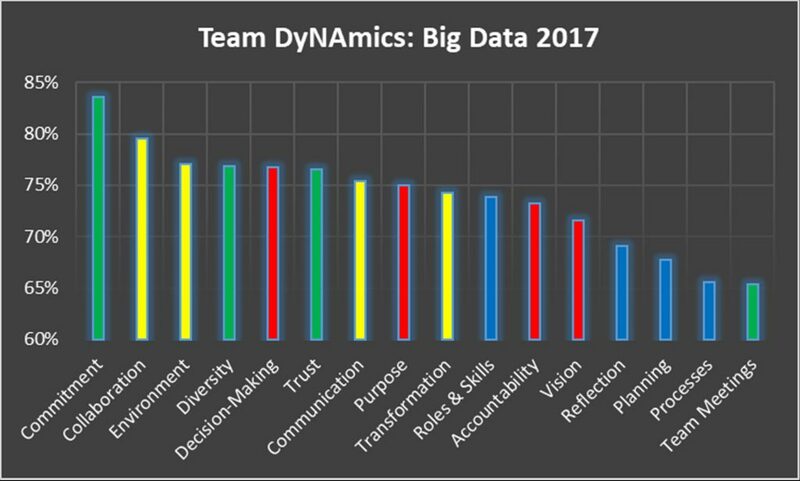 In fact, of the 16 Elements that need to be managed effectively, if you want to achieve a high-performing team, in the 2017 Big Data, from teams who used the Team DyNAmics Model, Team Meetings ranked the lowest. In a survey I read recently, it was stated that on average employees attend 62 meetings a month, that’s 3 a day. Unproductive meetings accounted for 31 hours of wasted time a month, per person. 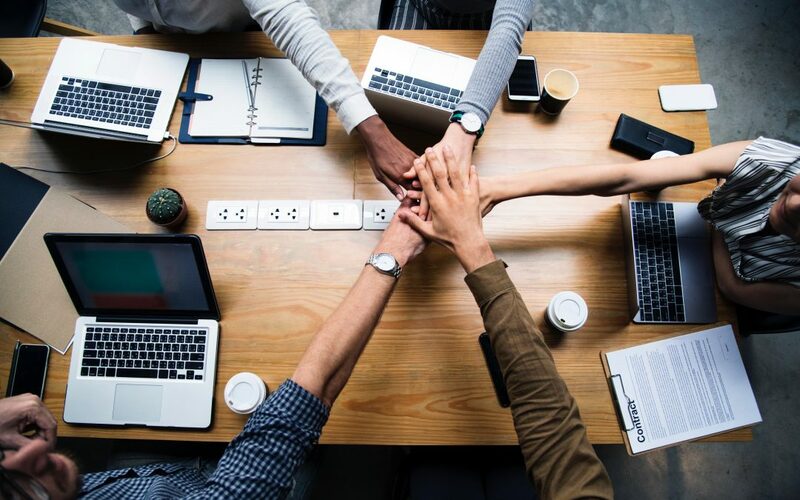 Almost half of those surveyed said that meetings were the biggest waste of their time when in the office and almost three quarters owned up to doing other work in meetings. Unproductive meetings have been estimated to cost the UK economy £26 billion a year. However, meetings are an essential part of our business lives and are not going to go away, so we have to therefore ensure that they are as effective as possible and meet the needs of ALL those who attend. I’ve deliberately capitalised the word all because that is where the root of ineffective meetings occurs, people, and importantly our differing needs. So to understand what’s going on, we need to understand people. The biggest cause of misunderstanding and miscommunication between individuals which manifests itself in meetings is the difference between Introverts and Extraverts. These two phrases were coined by the world-renowned Swiss psychologist, Carl Gustav Jung. Jung used these two words to describe where we get our behavioural energy from. Introverts primarily get their energy from within themselves, whilst Extraverts get their energy from interaction with others. At a top level, Introverts “think before they talk”, whilst Extraverts do the opposite, they “talk before they think”. Now, whilst we have a preference for one over the other, we can do both. The analogy I use is that just like we write with our favoured hand, if we injured that, we could still write with our other hand, albeit it wouldn’t be as comfortable as our preferred hand. Below are some phrases that are associated with Introverts and Extraverts. Read through them and make a note of the ones that resonate with you. The more you choose from one group over the other, the more of a preference you will have for that attitudinal function. If you have an equal amount of Introverted and Extraverted phrases that resonate with you, then you are more likely, like myself to be an Ambivert, someone who has more of a balance between the two. Remember, there is no right or wrong, just your preference and who you are. In your meetings, you are invariably going to have a mixture of preferences and if these attitudinal preferences are not understood, that is when frustration occurs. Quite simply, Extraverts like to share their ideas and views openly and therefore tend to hog the airwaves. Introverts on the other hand, are comfortable to just sit and listen and absorb the communication going on around them. Extraverts may therefore be thinking about Introverts “Why aren’t they speaking up and contributing?” whereas Introverts may be thinking about Extraverts “Why don’t they just shut up so I can add something to the conversation?” You’ll probably associate with one or the other of the above and no doubt experienced this in meetings you’ve been to. So How Can We Better Meet The Needs Of Everyone? Below are some tips that are tried and tested in making meetings more effective for everyone. 1. Get the agenda out early. Introverts prefer time to gather their thoughts and prepare whereas Extraverts can often speak ‘off the cuff’. 2. Go around the table to give everyone the opportunity to express their views. Introverts will appreciate not having to struggle to be heard. If you preference is Introversion, push yourself to speak up and share your thoughts and views. If your preference is Extraversion, keep quiet to allow Introverts to have their say and wait until it is your turn. 3. Introverts – nod your head and smile when your Extraverted colleagues are speaking, they need signals that you are engaged with what they are talking about. 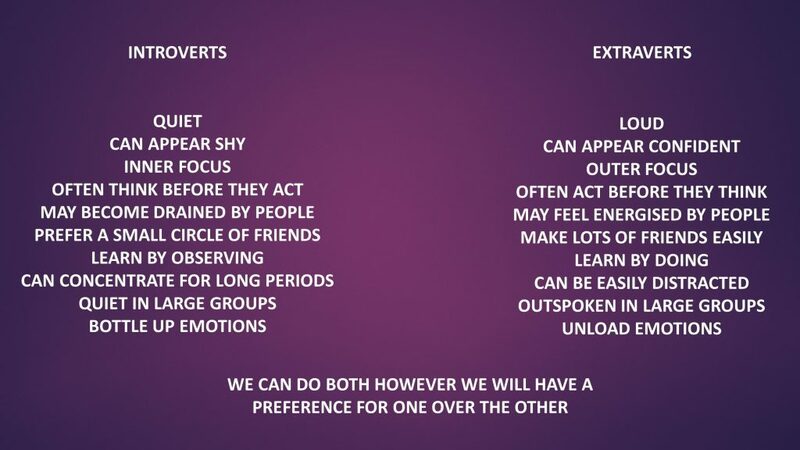 On the other hand, Extraverts please allow your more Introverted colleagues time to finish their sentences. 4. If the meeting involves a large group of people, consider breaking out into smaller groups to discuss an idea. Those with a preference for Introversion tend to find it easier to open up in a smaller group. 5. Consider writing questions down on a piece of paper and handing them around the group for people to add their individual comments. Works well for both Introverts and Extraverts. 6. Make a note of Any Other Business however don’t go into the detail of this at the meeting, add it onto the agenda for the next meeting so people can prepare to discuss it in more depth. 7. Keep 2-way communication channels open for a while after the meeting, in case someone has a great thought or idea after the meeting has finished. I hope that the above has given you a better understanding of why meetings can be frustrating and given you some useful tips to consider to make your next meeting a productive and effective one.